Introduction: The wide-field visual cortex, known as MT+/V5 and V6 plays a major role in the visual processing of motion in the brain. In the current study, we located the MT+/V5 complex, which was divided into three sub-regions: the middle temporal (MT) area for central stimuli and the medial superior temporal (MST) area and V6 for peripheral stimuli. Previous studies of these areas were typically limited to the central (eccentricity is from 8° to 30°) visual fields. Methods: Using a wide-view presentation system, we presented a horizontal and vertical visual angle up to 120° in a functional magnetic resonance imaging (fMRI) environment. Result: Our results suggest that the MT+ area is significantly larger than indicated by previous studies on wide-field stimuli. The MST and V6 areas responded strongly to peripheral stimulation, and the MST responded strongly to ipsilateral stimulation, while MST also responded to central stimulation. Conclusion: Furthermore, we also used retinotopic mapping with stimuli consisting of motion dots to localize the MT+ and the wide-field motion area V6. 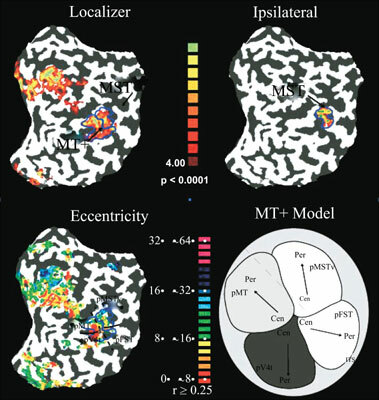 The retinotopic maps divided the composition of the visual field maps into four segments within a functionally subdivided MT+. Wide field, retinotopic mapping technique, MT+/V5, fMRI, visual area, human brain.